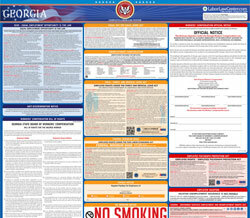 The Unemployment Insurance for Employees (Spanish) is an unemployment law poster by the Georgia Department Of Labor. This is a mandatory posting for all employers in Georgia, and businesses who fail to comply may be subject to fines or sanctions. This poster, written in Spanish, must be posted in a conspicuous place where all Spanish speaking employees will see it. This poster describes the laws for unemployment insurance for employees. It appears you don't have a PDF plugin for this browser. Please see the link below to download georgia-dol810sp.pdf. Su empleo está cubierto por la Ley de Seguridad en el Empleo. por causas ajenas a su voluntad y si cumple con todos los requisitos. de cada semana y cualquier empleo que haya rechazado.